Vertiply will enable your firm to create, store and update compliance information for your firm, clients, employees and vendors. The ability to store documentation related to each feature puts comprehensive information at your fingertips. The Policies and Procedures interface provides for comprehensive document tracking. Using Vertiply, administrators can easily manage policies and procedures. Employees will acknowledge those policies and procedures that managers assigned. When a level-one administrator signs into Vertiply, the program opens to the Administrator desktop. Administrators can add or edit policies from within the Policies interface. Policies and Procedures may be sorted and filtered. Admin-level users can notify employees of every level of all new or modified policies and procedures. Vertiply features an easy to use and intuitive drag and drop system that organizes key attachments for total compliance. Training is easy to manage, first create a record for each staff member. You can notify trainees by email or via the Vertiply message board. 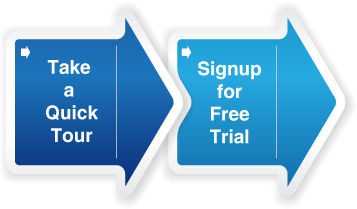 When users log into Vertiply, they can confirm that training has been received. The training menu allows you to document and view those who have received training, how many hours of training an employee has received and you can also set up training for multiple users. Create or import a spreadsheet to create multiple-choice questions and answers. Import spreadsheets to add test questions and answers. Set a minimum grade required to pass. Select individuals to take the test. Use the Vertiply message board or email to inform the user to take the test. When users log in, they can take the assigned test. You can also access an online, self-paced, video-based FDCPA & Certification testing site by clicking on the message box that appears in the Vertiply program on the right side of the Testing screen. Receive training and to take tests. The employee test records show the results of when an employee has passed or completed training and testing. View, add, edit and/or delete past and present remediation data. Tracking complaints and issues is an important part of account management. You can import complaints and issues from the software you use to manage your accounts. The CFPB has placed a high priority on compliance issues throughout many institutions. 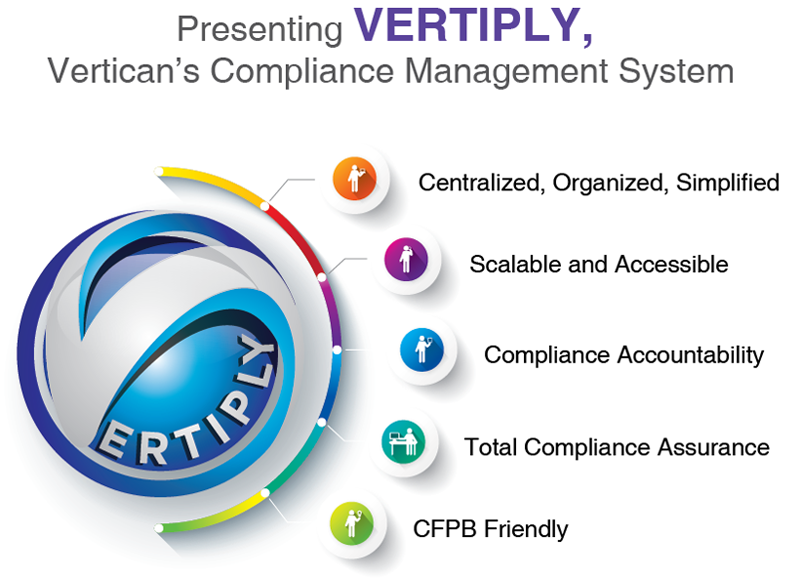 Vertiply provides the tools to help you not only meet, but to exceed compliance expectations from federal agencies as well as your clients’ demands. Administrators assign tasks to managers and to other compliance-management staff members. With Vertiply’s Client Status Reporting feature, you can share complaint status reports with your clients. is easy to manage in Vertiply. Creditors often request that you audit specific accounts on consumer phone calls and share the results. When account audits reveal staff errors, Vertiply’s telephone compliance feature makes it easy to manage. Document management which involves saving the telephone call audio files. Another management item is linking to employee remediation if any errors were found during the audit. ensures managers and compliance management staff are notified of any audit-related issues. simplifies the process of sharing audit status reports with your clients. can only be accessed by administrators, managers, and report administrators. The Report program displays a grid that you can sort by clicking on the header for a report number, group or report name. by clicking on the [Run Report] button or simply double-clicking on the desired report that appears in the grid. Prior to running the actual report, you can set a variety of report options in the “Run Reports” filter screen. capabilities exist. Similar to the “Run Reports” filter screen, the Export Report feature provides a variety of filter options you can set before exporting the report. Report templates can be predefined or customized. Vendor management provides for complete recording, tracking and results of all of your vendor audits. Another handy feature is the ability to share those audit results with your clients. A vendor repository maintains key compliance information regarding every vendor you partner with. Vendor audit history, as well as termination information is maintained on the vendor data tab. Vendor documents, such as important non-disclosure agreements, contracts, agreements, and more are maintained. The Document Manager features a simple Drag and Drop interface. The Vendor Tracker tracks information such as passed and failed audits, vendor reports, contact information, related documents, notes and more. When your creditors need to know who your vendors are and what type of audits are planned or have been given, the Vendor Tracker can make that information immediately available. When your client has a vendor related question, the Vendor Tracker helps you to answer who, what, when and where with accuracy and authority. 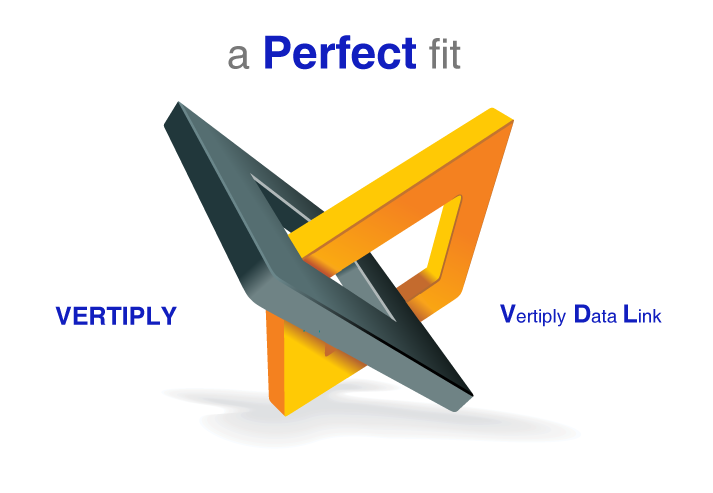 Because there are two dimensions to compliance; what you need and do internally, and what your external vendors and business partners need and do, Vertiply Compliance works seamlessly with the Vertiply Data Link (VDL). The VDL is a secure, web‐based portal designed to manage multiple business partners who use Vertiply Compliance. 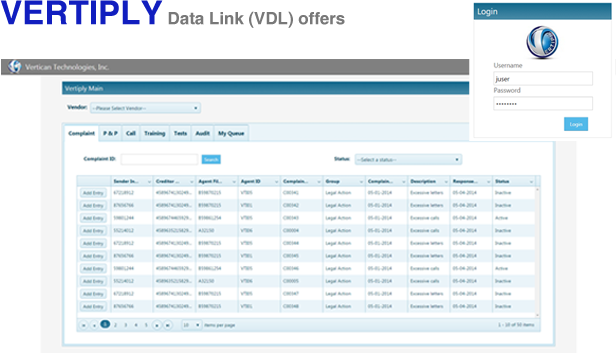 The VDL automatically aggregates Vertiply Compliance data from an unlimited number of Vertiply Compliance systems, providing single point management on all compliance related matters, for every business partner. Together Vertiply & VDL create an automated and transparent work-flow to manage your compliance needs. Whether you are a servicer or issuer, Vertiply & VDL are your solutions for success.